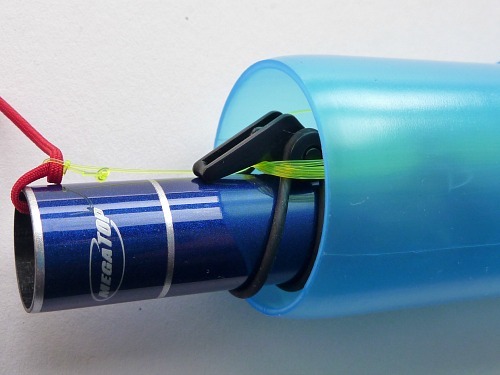 Fuji EZ Keepers offer a convenient way to manage your line when you collapse your rod. Perhaps their biggest advantages are that you will not get line twist and your fully rigged and collapsed rod fits inside the Ebira rod quiver so you can be ready to fish in seconds. Designed for spin fishermen to hold a lure securely, which only requires one keeper, they come only one to a pack. For tenkara line holders, two EZ Keepers are required. They come with two "o" rings per pack, a large one and a small one. You will use both. 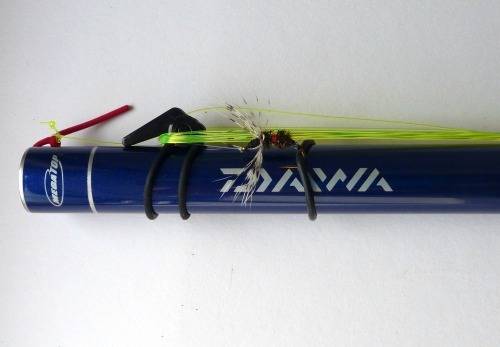 The large one is used to hold the EZ Keeper to the rod, and the small one is used to hold a fly. 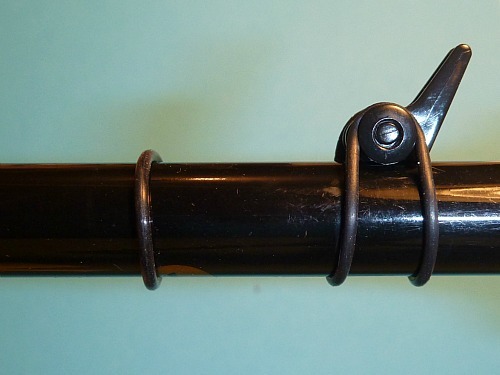 Using the large "O" rings, mount the EZ keepers so that the one closer to the grip angles backwards when flipped up and the one towards the tip end of the grip section angles forwards when flipped up. The two smaller "o" rings are put on the rod between the two EZ Keepers themselves. To hold your line as you move between spots, first collapse the rod, then flip up each of the EZ keepers. Wrap the line around them in a figure 8, which is important because it will prevent the line from twisting as you wind it. 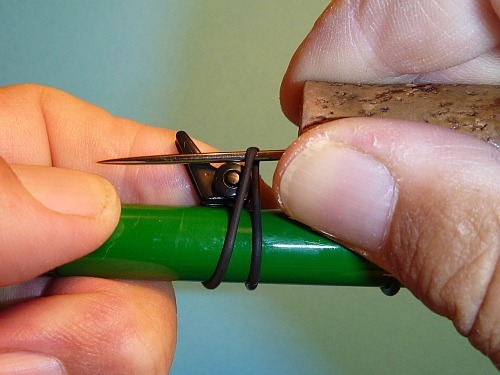 Hook your fly under the nearest of the small "O" rings, moving the "O" ring to tighten the tippet. You can use the second "O" ring to hold a second fly on a dropper. When you are ready to fish again, unwind the line and flip down the EZ Keepers. 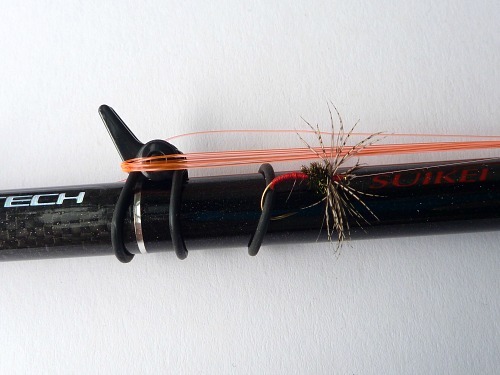 You will have to stretch your line a bit to relax the memory, but that is a small price to pay for having no tangles and no line twist as you move from spot to spot. And don't be so concerned about getting out all the memory. When a slight coil in the line suddenly straightens out, it is a very sensitive indicator of a strike. Not long after I first published the page on the Fuji EZ Keepers, people told me there was a better way to attach them. They argued, convincingly, that if the EZ Keepers are mounted facing the other direction they will hold the line much more securely. That way, the EZ Keepers hold the line when they are folded down, rather than in their up position. Although it has not happened to me, if they are attached as shown in the top photo on the page, it is not hard to imagine that one of the clips could get pushed into the down position accidentally, releasing the line when you don't want loose coils of line floating around. If they are mounted so that they hold the line when they are down, it would be much less likely that they could accidentally get flipped into the up position, releasing the line. 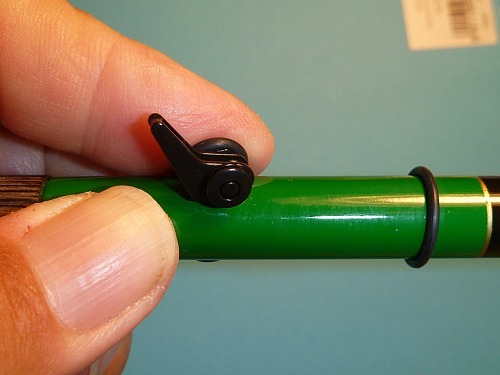 It is a little more time consuming to wrap the line when the clips down, but you can slide the line under the clip. It is just as easy to release the line when you want by just pulling up on the clips. If you wrap in a figure 8 rather than just around the EZ Keepers, the line is much less likely to tangle when it is released. 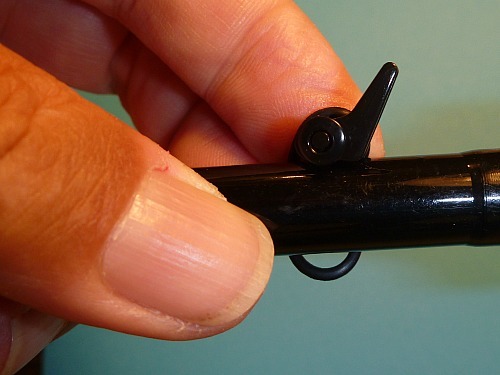 There is another significant advantage to attaching the EZ Keepers this second way, particularly for the Daiwa Keiryu-X, Nissin Pocket Mini and Shimotsuke Kiyotaki. Those rods will fit in a Small Rod Case with the EZ Keepers and line attached - but only when the EZ Keepers hold the line when they are folded down. Please note: the O rings supplied with EZ keepers will not fit around the Keiryu-X 45. I have been told you can buy larger O rings at a hardware store but I have not tried. I must say that I like the Small Tenkara Line Holders, because you can keep lines fully rigged independent of the rod. You can also pre-rig multi fly casts for pesca mosca Valsesiana, which you really cannot do with the Fuji EZ Keepers. That said, the ease of use, lack of line twist and ability to slide a fully rigged rod and line into an Ebira Rod Quiver (which you can't do with the blue spool) make the EZ Keepers a very reasonable choice for tenkara anglers who do not pre-rig their tippets. They come in a number of colors. I took my cue from Henry Ford, when he started selling the Model T. If you order the EZ keepers from TenkaraBum.com, you can have any color you want, as long as it's black. 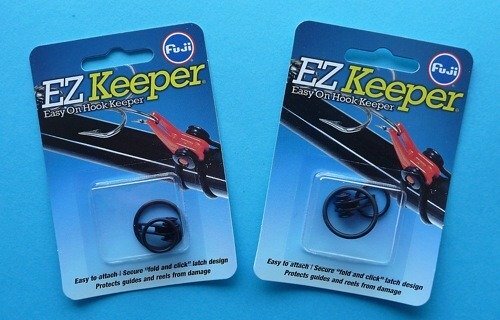 Please note: Fuji EZ Keepers will not fit on larger diameter keiryu rods with the O rings supplied in the package. I have had a number of customers tell me that with larger O rings available at any good hardware store they'll fit just fine. At some point, though, the angle at which the O ring hits the flange is too shallow for the O ring to hold. I don't know where that point is because for the larger diameter rods I've always used the Small Tenkara Line Holders. 1. Do the one at the grip end first. 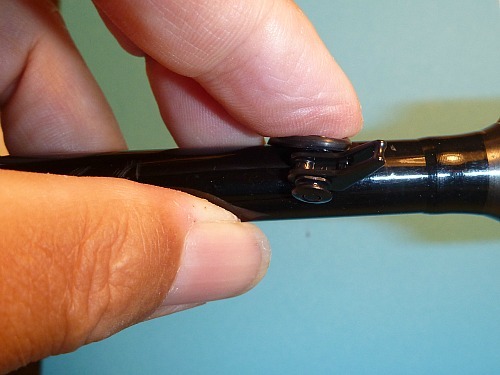 Hold it in place with your index finger with the large O-ring over the protrusion on the far side of the rod. 2.The bottom of the large O-ring should show below the rod. 3. 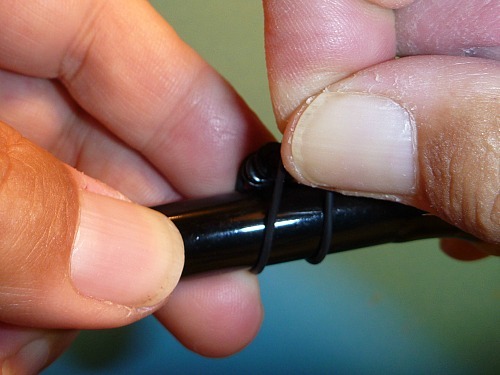 Grab the bottom of the O-ring with your thumb and index finger, stretch it downwards, then pull it up and over the protrusion on the near side. You have to hold the other index finger steady so the EZ Keeper stays in place. 4. You then put both of the smaller O-rings onto the rod. These are for hooking your fly under after winding the line and tippet. 5. Then put on the other EZ Keeper the same way. Make sure both point outwards when they are in the "up" position. 6. As an alternative to your thumb and forefinger, you can pull the O-ring up and over the near protrusion with a sturdy dubbing needle or bodkin.